This first chapter deals with some essentials of Management Information Systems. The main concern here is, from the corporate perspective, on a broader interpretation over time, and it may be necessary to know before proceeding to the purchase of a new MIS how the actual implementation and uptake of the new system will look like. 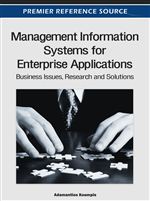 The chapter also elaborates on a non-exhaustive list of key issues that are relevant and connected with the notion of a Management Information System. The author also makes a quite interesting examination of a business case dealing with the introduction of an MIS to support independent film makers. Management Information Systems is considered as a rather obsolete term – it dates back to the times of centralised computing, mainframes, batch processing, and a report-centric culture in the corporate world. Though this report-centric governance is not necessarily over, the term Management Information System is not at all reflecting the practices in use for the last twenty years. So now the problem is how to proceed with such a term? Try replace it with something that might reflect the current situation in companies and organisations? My view is that even in the case that we replace the term with other ones that might satisfy certain criteria like technology (Web Information System) or architecture (distributed information system), the bottom-line is still the very same: we talk about information systems that are facilitating management at all levels, hence the term Management Information Systems is still satisfying and reflecting the reality we face today. How do companies prepare themselves for the introduction of a new Management Information System? OK, these times we rather prefer to talk about ERP systems (Enterprise Resource Planning systems) or Customer Relationship Management systems (CRMs), mainly focusing on operations or functions that a new system or subsystem is responsible for. But the core question of how to cope with costs still matters. Costs may appear in many different forms and types: development costs, operation costs, overhead costs, hidden or shadow costs. In whatever way a person or a company may have calculated any related costs, there is always space for improvements: some new way to approach the cost aspect so that you can converge to a new smaller or – usually – quite bigger number. Budgeting is not always considered as a science therefore people tend to leave this task to people with less experience in seeing (and most importantly being able to understand) the big picture. Nobody doubts that many business success stories have been the result of the tedious and lonely efforts of a single person – an individual who for some reasons aimed high and achieved something that a team of persons would not have thought of. However, and though praising a culture of megalomania is not a rarity in the business world, to have some individual fantasizing a new Management Information System, followed with innovative and path breaking business processes is not always going to end as a success story. A new system needs to be understood by all the people who are going to use it. Developing an understanding is not an easy task – and is not something that can be achieved by the end of a 2 hour (selling) presentation with few only questions. Usually, the best way to make good use of the knowledge and intellectual assets of your people is by having fostered a conversational culture or a discussion-based style. People should feel comfortable to come with their doubts, their objections and their own views and feel rewarded by – not necessarily having their ideas being implemented but at least be given some time and some deeper thinking. A curse in the corporate world is the uncontrollable lust for quickness we face for things that usually need their time. Why implement an idea here and now? Or why alternatively reject this idea again here and now? Many things in the corporate world need much more time than we initially anticipate so lets be generous with time especially in times that we are not able to be generous with money. A failing aspect for many young MBA graduates is that in their business process improvement equation they totally leave out the evolution dimension which needs great amounts of time to come up with genuine novelties in processes or products.